As part of of efforts to improve the site we are gradually adding product attributes to help filter categories. These will be available in the future. It is already active in Coins and some other categories. 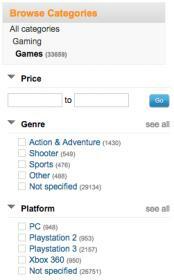 Hi Multi Collection - You can filter by platform and genre in the gaming category. Have a look below the categories and you'll see some more options. - I hope this helps. Let us know if you're still having difficulties with this and we'll try and help further.